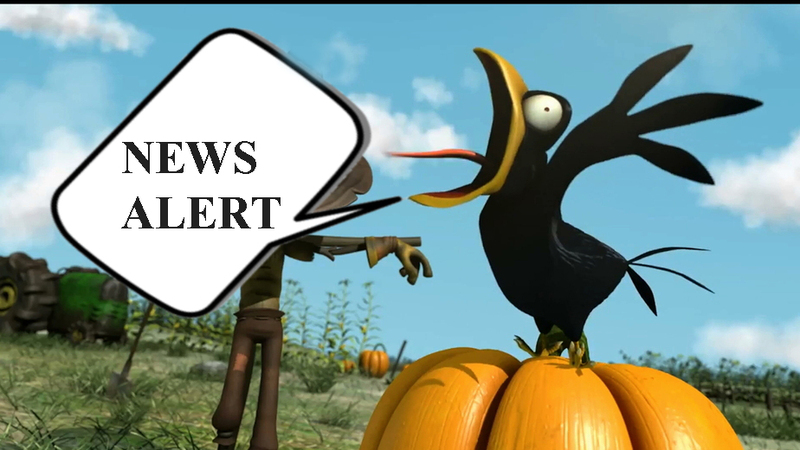 2020 Suffrage Centennial News, plus VIDEO! Support the “Spirit of 1776” suffrage wagon on permanent exhibit at NYS Museum! on Vimeo. The Chicago City Council has renamed a historic downtown street after activist Ida B. Wells. Congress Parkway will be renamed Ida B. Wells Drive. Her descendants, friends, and supporters have been raising money to build a monument in her memory. The Pomeroy Foundation has announced an expansion of the Historic Roadside Marker Grant Program. It is now open to all municipalities and 501.c3 organizations in New York State. The Pomeroy is also testing an expansion of the program on the national level. Stay tuned! As of March 2018, the Pomeroy Foundation has installed over 495 historic markers in 53 New York State counties. The American Association for State and Local History (AASLH) Women’s History Affinity Group is developing a 2020 Suffrage Value Statement, with best practices and principles for the upcoming centennial commemoration of the 19th Amendment. The group is surveying the field for comments to help develop the statement. The deadline to submit comments is August 15, 2018. You can participate here. We can’t keep up with all the celebrations and special programs scheduled across the US to commemorate August 26th, Women’s Equality Day. One example is the Miami-Dade County Commission for Women, The Women’s Park, and the League of Women Voters who will host their sixth annual commemoration for women’s equality on Saturday, August 25, 10-1, at The Women’s Park in Maimi, FL. There’s a special bus tour of Washington, DC leaving from the Belmont-Paul national historic site (National Park Service) on August 26, 2018. The 1913 parade route will be featured, along with other sites of interest. The Suffolk County Historical Society in Riverhead, NY (on Long Island, NY) continues its membership drive. The Historical Society has a lively program of exhibits and special programs. Part of the popular suffrage exhibition of Long Island activists is still on display. Here at SuffrageCentennials.com we loved sending friends and interested folks over to the New York State Museum in Albany, NY to see the “Votes for Women” exhibit that went up in November 2017 and came down in May of 2018. The display was thrilling to see. The “Spirit of 1776″suffrage wagon was part of the exhibition. Now we are on to the next phase of planning for the national suffrage centennial in 2020 when it’s anticipated that the wagon will be on exhibit again. The celebration of the 2020 national suffrage centennial has opportunities to get involved. And this doesn’t just involve sending money. The initiative for 2020 has relied, so far, on many volunteers to spread the word and organize others to carry out the work. There are opportunities to research and add to a database of first wave activists. Organizers are scouting for locations to erect historic markers to celebrate votes for women, an initiative of the National Votes for Women Trail. And there is more. Stay tuned! Have you made plans yet for August 26th—Women’s Equality Day? 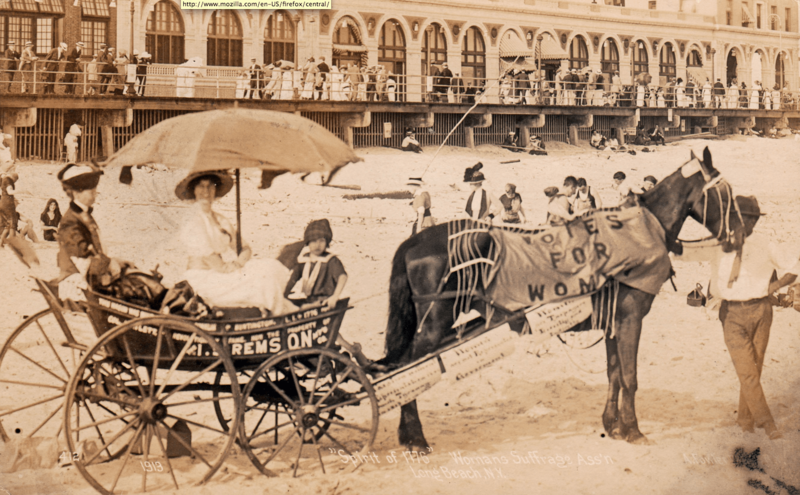 The “Spirit of 1776” wagon on its first grassroots organizing campaign in the summer of 1913. Photo courtesy of Rose Gschwendtner. 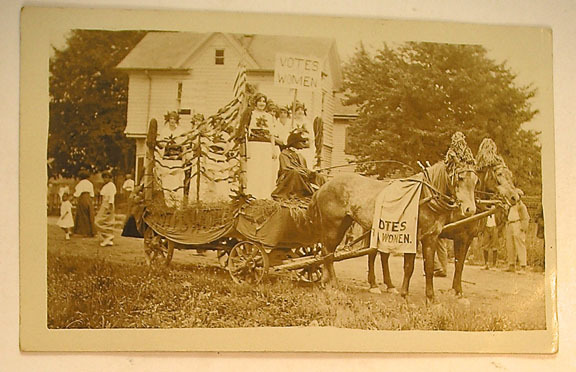 This entry was posted on August 4, 2018, in Blog and tagged "Spirit of 1776", 2020 suffrage centennial, suffrage wagon. Bookmark the permalink. ← Birthday for Suffrage Centennials in 2018—plus news of interest!